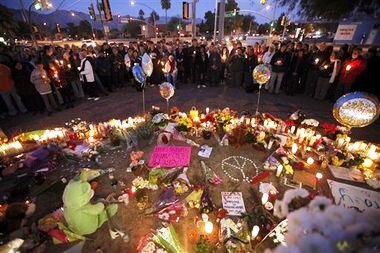 The good people of Tucson, Arizona are still reeling from the massacre in a shopping mall a few days ago that killed six public-spirited citizens and wounded 13 other folks including a popular congresswoman. Horrendous and heartbreaking as it was, it was just the latest outbreak of a peculiar American ritual. Given enough time, every community from Florida to Alaska, Maine to Hawaii may experience the all-American, historical ritual of shooting up the place. On the first day of spring in 1995, one of these ritualistic, self-proclaimed rites of firing a firearm into a peaceful crowd took place in the town where I lived. It was another in a widespread pattern of such shootings across the USA that it had its own slang name: “going postal.” Here’s what I wrote about it some time after. Nothing much has changed except the names of the places and the victims. murder and mayhem in Montclair. I call home; no one answers. and check on their own kin. the grotesquely spot lit post office. to express the shock of suburbia. and worked for the town DPW. asking how things were going. post office at the wrong time. executed us in a row on the floor. Thanks, Jan. I like the poem. This business of routinely “firing a firearm into a peaceful crowd” is all too common, and it has to stop. I’ve spent too many years in other parts of the world where packin’ heat isn’t considered to be a god-given right, and these kinds of incidents rarely (if ever) happen. I don’t know if we’ll ever solve this problem, but we ought to try.